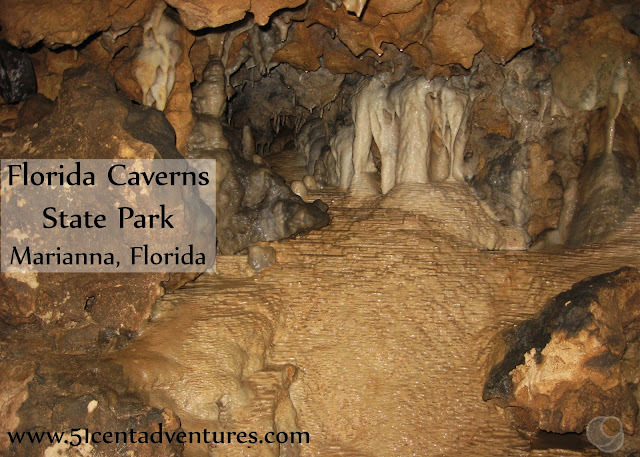 Description: Florida Caverns State Park is home to a beautiful cave that provides an excellent chance to see the wonders usually hidden under our feet. Constant dripping water has turned the limestone inside the cave into beautiful formations. 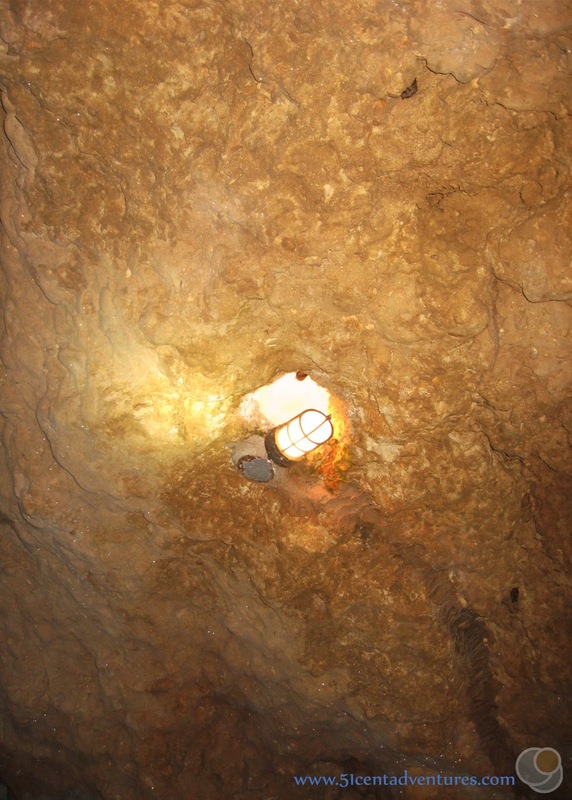 A tour of the cave lasts about 45 minutes and travels through many chambers over 3/4ths of a mile. 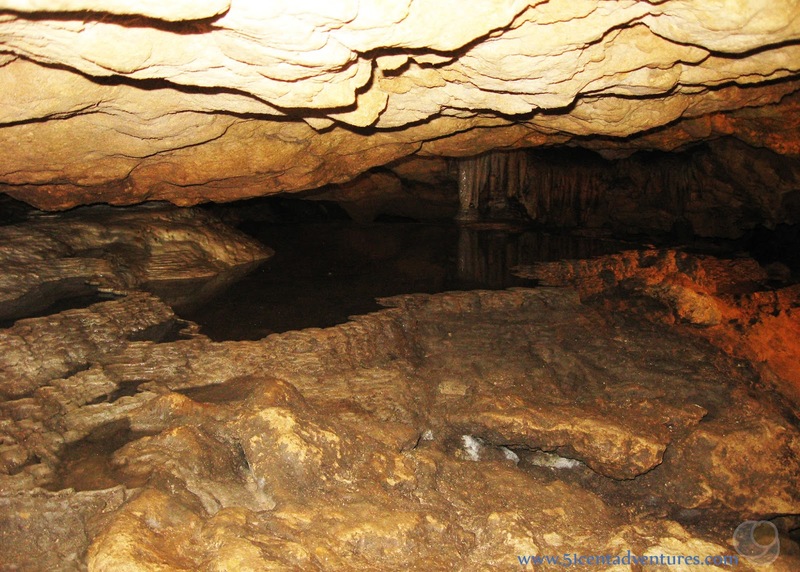 Outside the cave there are many hiking trails, and even a swimming hole formed by two natural springs. Location: 3345 Caverns Road Marianna, Florida. Marianna, is in northwest Florida. Cost: Entrance to the park costs $4 for a vehicle with one occupant or $5 for a vehicle with up to 8 occupants. 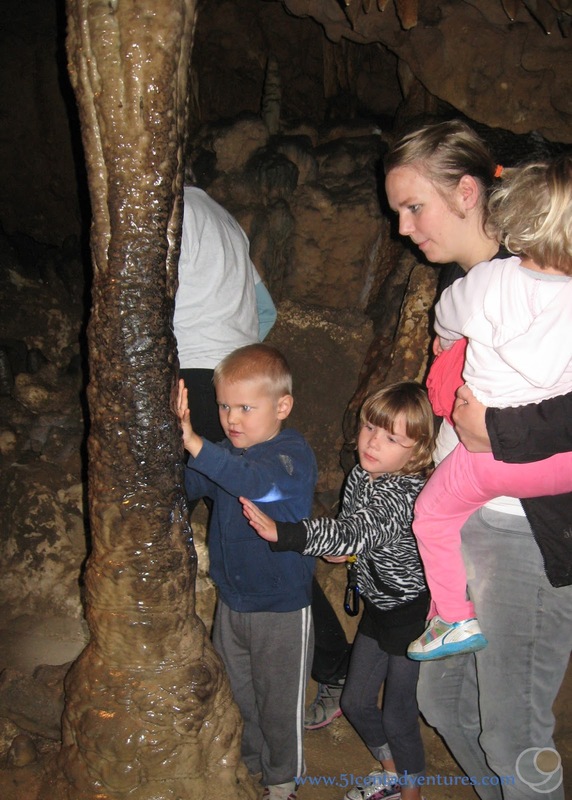 Cave tours are $8 for adults and $5 for children ages 3 to 12. Children under 3 are free. (However, be aware that babies cannot be carried on your back. Front packs are okay.) Groups of 25 or more people can get a discounted price of only $4 per tour. Camping is $20 a night. Operating Seasons and Hours: The park is open every day from 8:00 am to sundown. 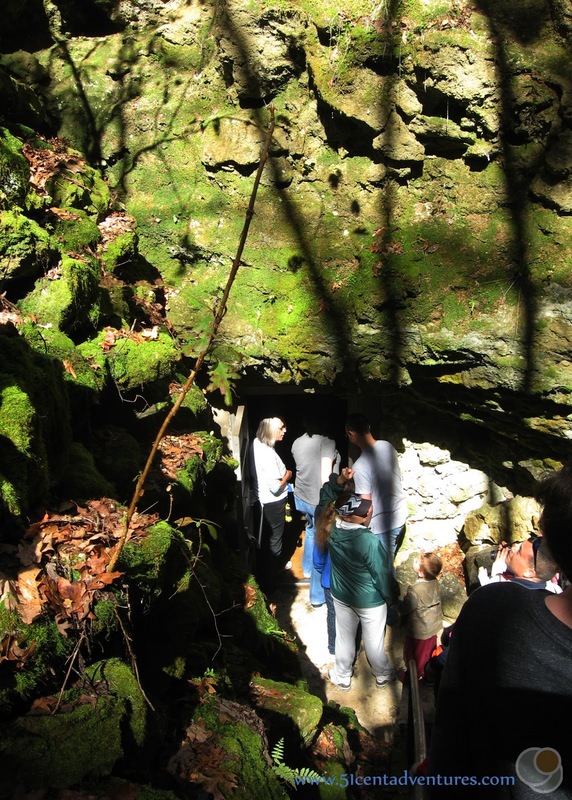 Cave tours are not available on Tuesdays or Wednesdays or on Thanksgiving or Christmas Day. I'm trying to be better about quickly posting about the adventures that my family goes on. So today you get to read about our adventure last Saturday at Florida Caverns State Park. I have wanted to go to Florida Caverns State Park for several months. We were tentatively planning to take my extended family there over Christmas. However, that didn't happen. So when the weather promised to be a beautiful 65 degrees on Saturday we decided it would be the perfect time to go check out the state park. My husband actually visited the park over the summer. This was when he was had to stay in Alabama for some training while I took the kids on a roadtrip to a wedding in Utah. My husband had been bored one weekend, and I'd sent him on a recon mission to check out this state park. He's wanted to bring all of us there ever since. 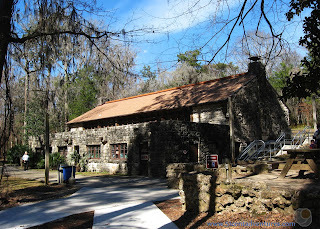 When we arrived, my husband ran up to the visitor center and booked us tickets to a tour leaving in about 45 minutes. That left us with some time to explore the visitor center. The visitor center was built in the 1930's by workers from the Civilian Conservation Corps. The downstairs part of the building has the gift shop where you purchase cave tour tickets. Upstairs there were interesting displays about the cave and the local area. 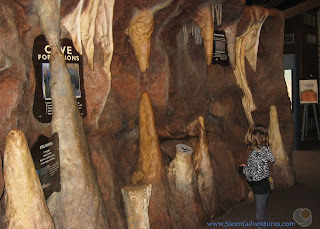 It was a good way to introduce our kids to what to expect inside the cave. Since the cave tour is considered moderately strenuous it isn't for everyone. The park has made a movie of parts of the tour which anyone can watch to see what the cave is like. We watched a little bit of the movie. 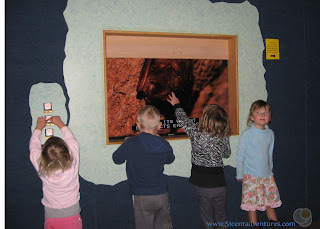 Our kids liked the bats. Then it was time for our cave tour. I was really excited. Over the years I've gone on several cave tours. 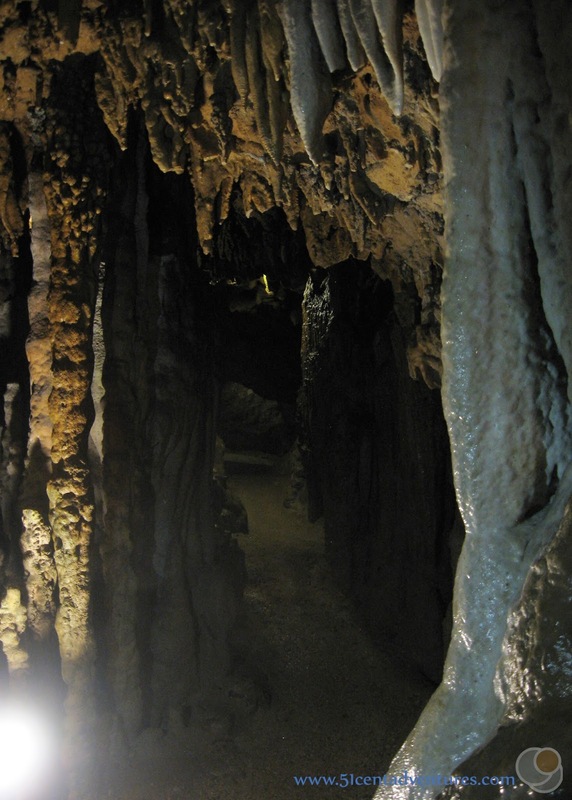 When I was about 8 my dad took me and my sister to Timpanogus Cave in Utah. 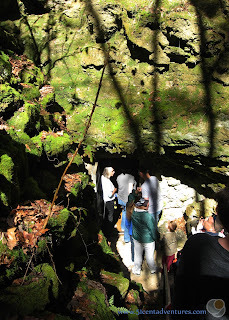 Later, when I was a teenager, my brother talked one of his scout leaders into taking my family on a tour of the (now closed) Nutty Putty caves. 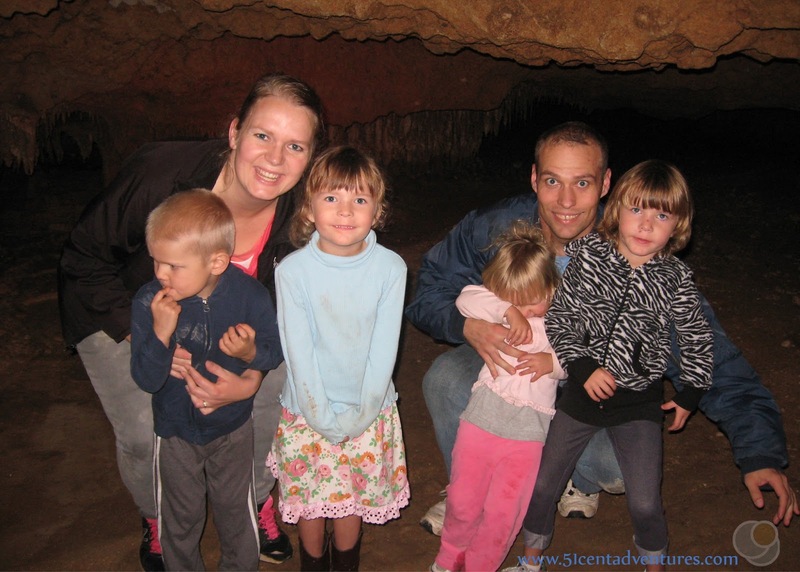 As an adult, my husband and I took our 20 month old twins and our 3 month old baby boy on a tour of the Cave of the Winds during our Colorado Roadtrip back in 2012. 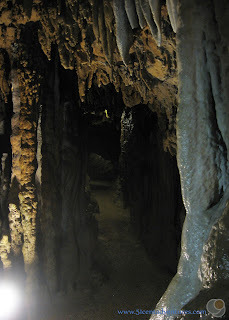 And last year my husband and I went on a tour of the InnerSpace Caverns as a Valentine's Day Date. While that sounds like an impressive list, there are actually many more caves that I wish I'd been able to visit. 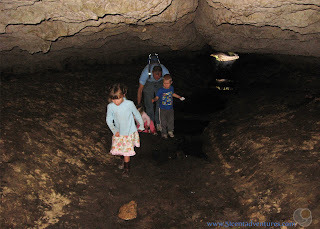 When we lived in Texas there were at least 5 caves within day-trip distance, but our kids made it almost impossible to visit them. It seems like we always had at least one baby who was too small to walk, but too heavy to be carried for long periods of time. 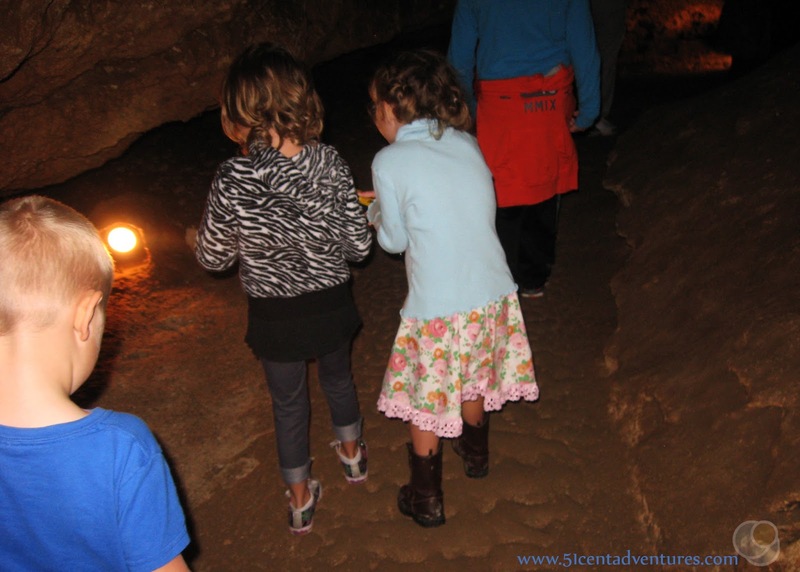 The fact that every cave tour in Texas is about $18 a ticket didn't help things either. I just didn't want to pay that kind of money to lug 20+ lbs of baby around. So going into the Florida Caverns cave would be the first time we've explored a cave as a family in 3 1/2 years. 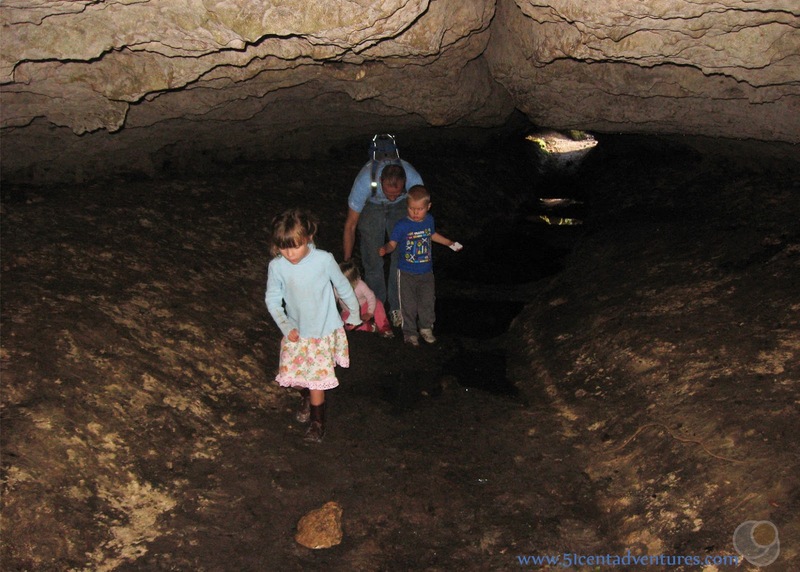 Now that our youngest child is over age two- and able to walk long distances- exploring caves is something we can do again. The tour started out with some general explanations from our tour guide, and then we walked a short distance to some stairs that led down into the cave. 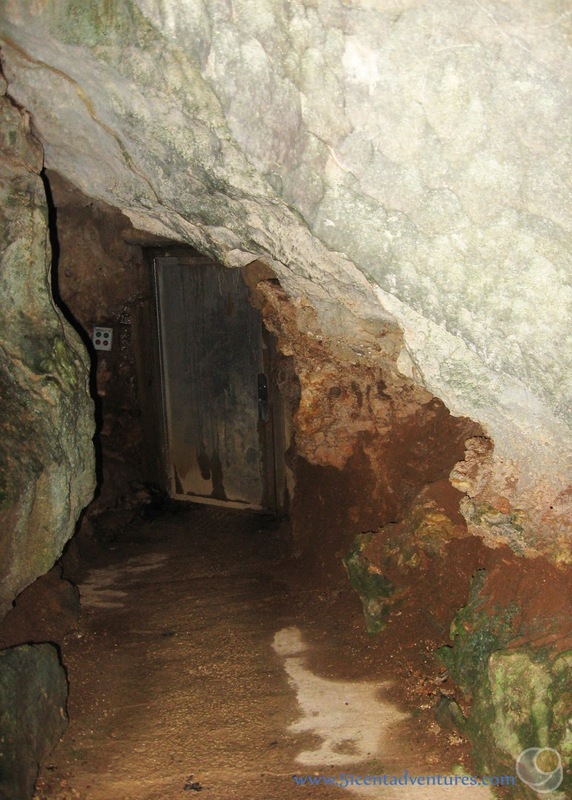 We entered into a large chamber with a path that switched back down about 20 feet. At the bottom of the chamber was a pool of water. Our guide explained that this was one of the only caves in Florida that wasn't underwater. But that it still had water inside it. After that we walked through a tunnel cut through the rock and came into a different chamber. I'd been a little worried about how my youngest children would do in the cave. They actually did just fine. My 2 year old daughter kept trying to charge ahead of our family. My 3 year old son kept saying, "Go in the tunnel." (He didn't know the word cave yet so I'd been telling him we'd go in a tunnel.) Later in the tour he started copying me when I said, "Go in the cave." My five year old twins were actually more scared than their younger siblings. They stayed close to their daddy and seemed very nervous about everything. I was very impressed by all the different formations inside the cave. 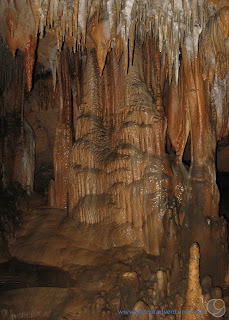 Up until now I haven't been in caves that have a lot of stalagmites, stalactites, and columns. But this cave had them every where. It even had rim pools which I don't think I've seen anywhere else. This is a large rim pool. The water was so still that it looked like glass. Here are some smaller rim pools in another room. It seems like we went in at least 10 different chambers or rooms. Each one had a different name based on the prominent features of the room. This is the Cathedral from the Cathedral Room. My favorite part of the tour was when we had to walk through a narrow walkway. 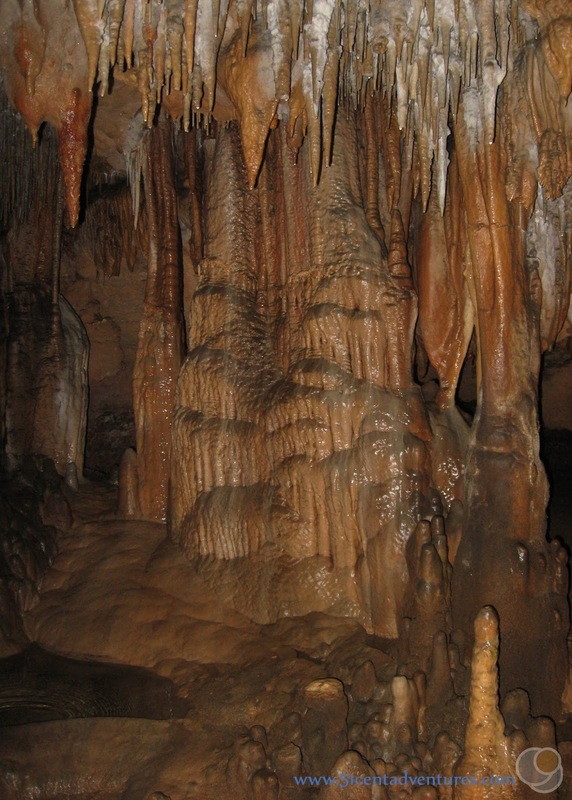 There were stalactites, stalagmites, and columns on either side. I've never been that close to features like that. Our tour guide had noticed how scared my twins seemed to be. She gave one of them a flashlight. Suddenly they were so exited about the tour. They would stand right by the tour guide and listen to everything she said. We had to remind the younger two not to touch a few things, but overall they did really well. In fact, they were hesitant at first when they were allowed to touch this column. As the tour went on my youngest got more upset. She wasn't too happy about not being able to touch things and I could tell she was getting tired. She wanted me to hold her every time we were standing still, but she wanted to walk by herself when we were walking. She wasn't too happy about staying still for our family picture. The twins had been hoping to see a bat, so they were really happy when the tour guide pointed out one that was near a light. Earlier in the tour she had explained that the CCC workers had put their dinner plates up on the ceiling to help reflect lights. One of my girls remembered that and excitedly said, "And there is a dinner plate." The last little bit of the cave was called Tall Man's Misery. Which turned out to be pretty true. My husband bonked his head and got a one inch long cut. It wasn't bleeding, but the tour guide made sure to doctor it up at the visitor center. My two year old daughter also ended up bonking into a low rock too. She was crying so bad that the tour guide let us go out ahead of everyone else. It was nice to get back out into fresh air and sunshine. This is what the cave exit looks like. We walked up the steep incline and waited for the tour guide at the top. She walked back to the visitor center with us and made sure to take care of my husband's cut. As we walked we told her how much we had appreciated the tour. By now it was lunch time and we were all hungry. There were a few picnic benches by the visitor center, but most of them were near the parking lot. We were concerned that our kids wouldn't be careful around all the cars. So we decided to drive over to the picnic area. This turned out to be a great decision because there was a play ground over there. We had a nice picnic lunch, and the kids loved playing on the playground. 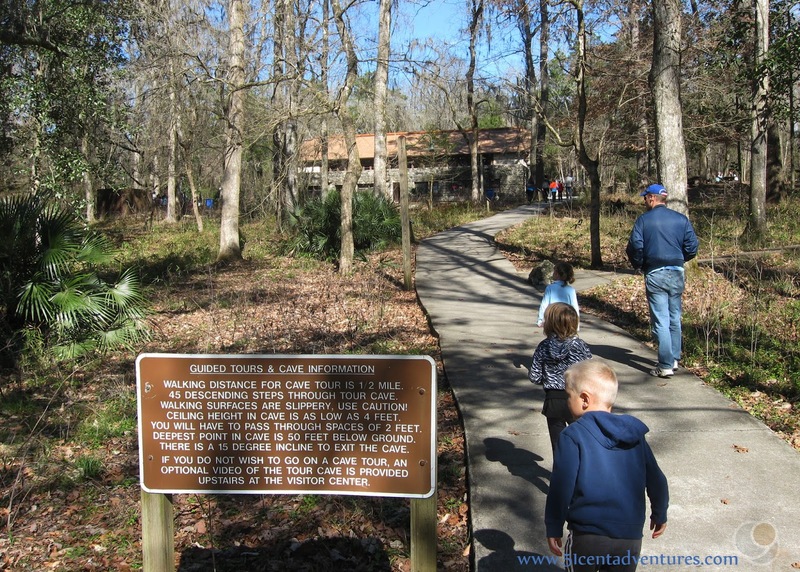 Then we went back to the visitor center parking lot and we went on the Bluff Trail so my husband could show us what he discovered over the summer. It was a little tunnel. The kids walked down that until they got to a puddle that was covering the whole trail. 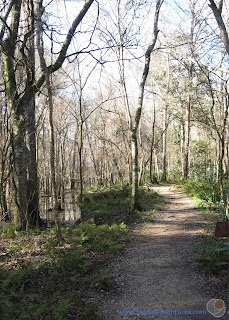 Then we kept walking on the trail. 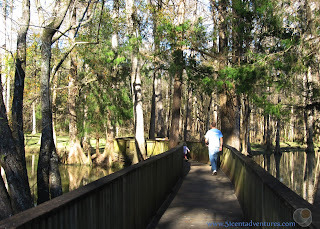 There was a swamp on one side of the trail and my son enjoyed throwing rocks into the water for a long time. Eventually we made it back to the car, but we weren't done with the park yet. 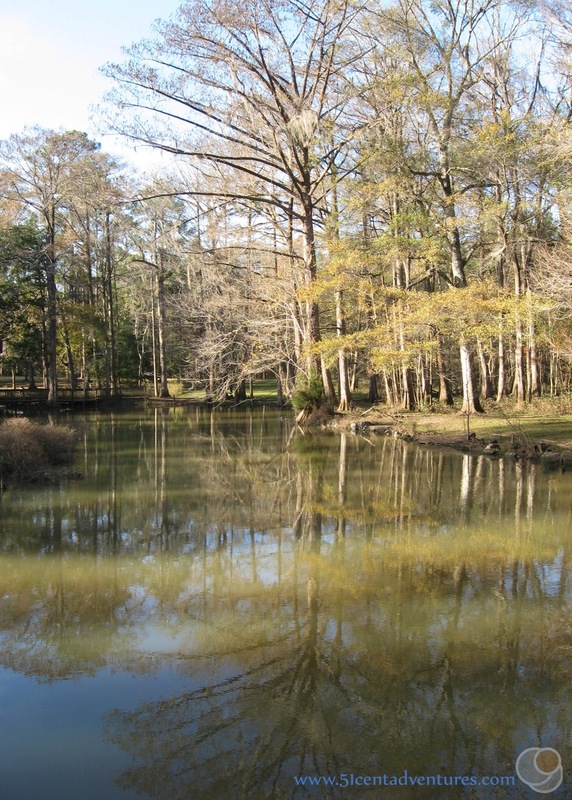 We went to see the Blue Hole which is a pond formed by two natural springs. 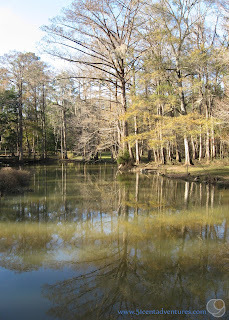 Usually the water is a beautiful blue, but there have been quite a few heavy rainstorms lately and those have mixed lots of dirt into the water. So it was kind of brown, but still very pretty. There were two bridges built over the water and the kids had fun running across them. 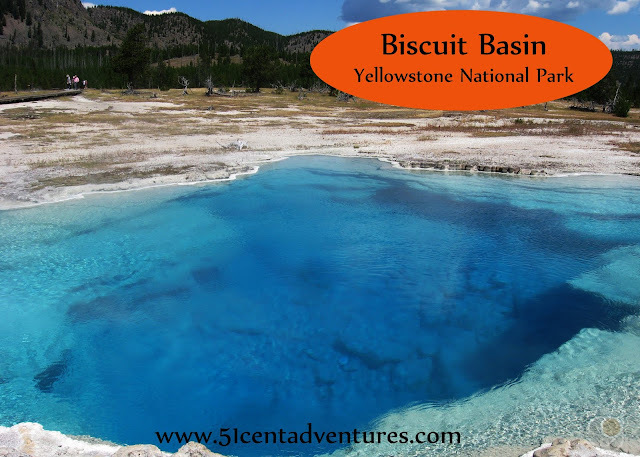 You can swim here when conditions are right, but beware because the north vent is 97 feet deep and the south vent is 26 feet deep. Eventually, our kids were completely worn out and it was time to get going. I think we were all a little sad to leave such an interesting place. The good news is that since we live so close we can come back here soon. 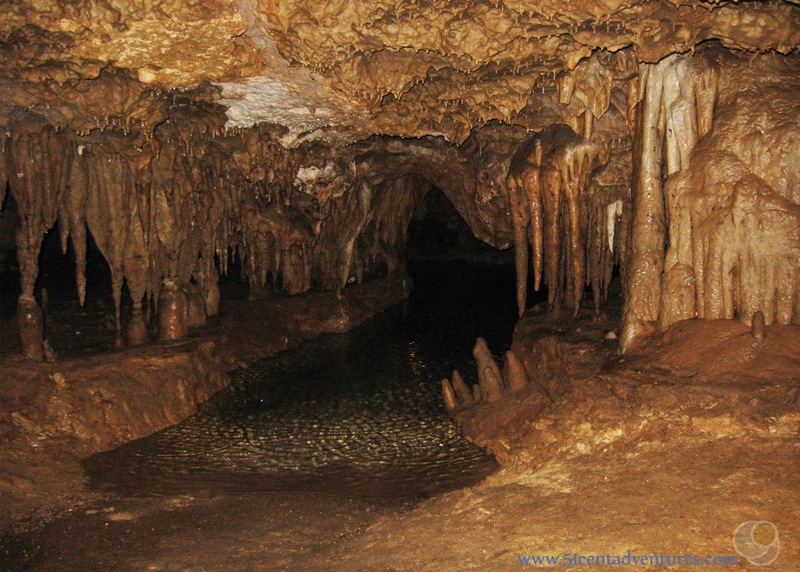 Recommendation: If you will be anywhere near Florida Caverns State Park you should definitely plan a visit here. I was especially impressed by the price of the cave tour. 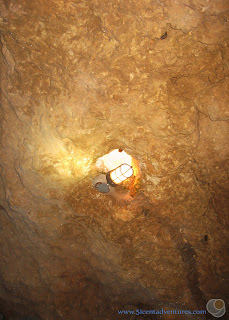 In Texas most of the cave tours were around $18 for an adult. So by comparison $8 per adult ticket is a great deal. And the features in the cave did not disappoint. 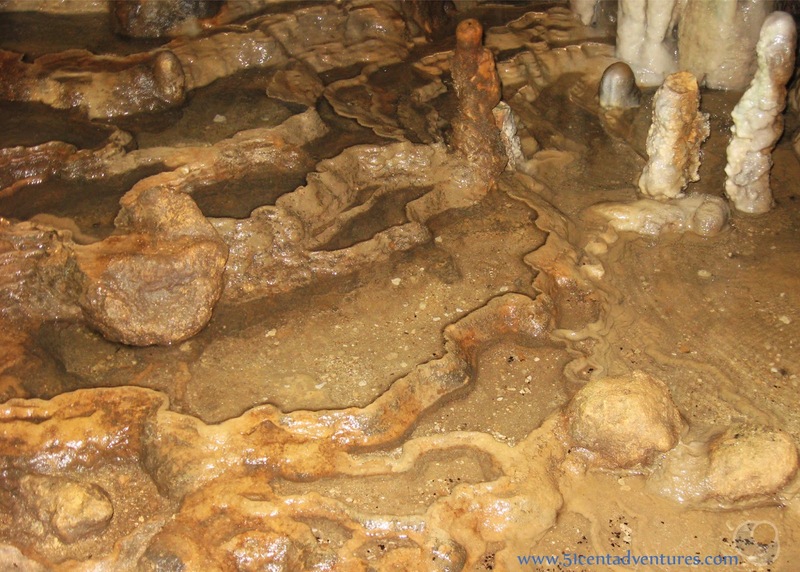 Even if you don't explore the cave there are many interesting things inside the park. 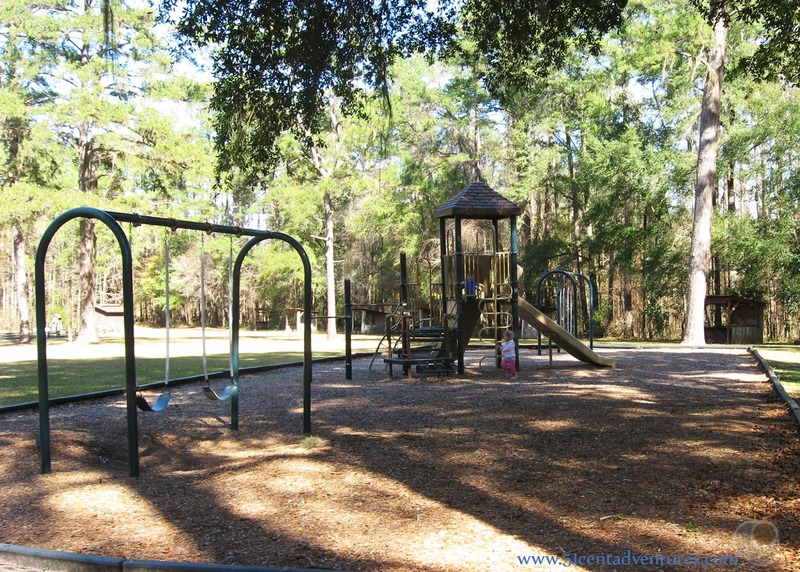 Directions: The park is located 3 miles north of Marianna, Florida. 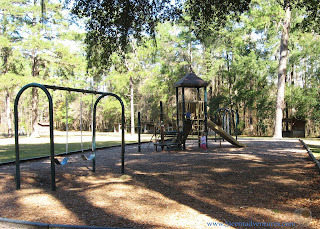 We traveled to the park on Highway 231 from Dothan Alabama, but this park is actually really near I-10. If you are travelling on I-10 this place would be the perfect side trip. Follow signs to Marianna. Once you are in Marianna you will see signs for the state park. 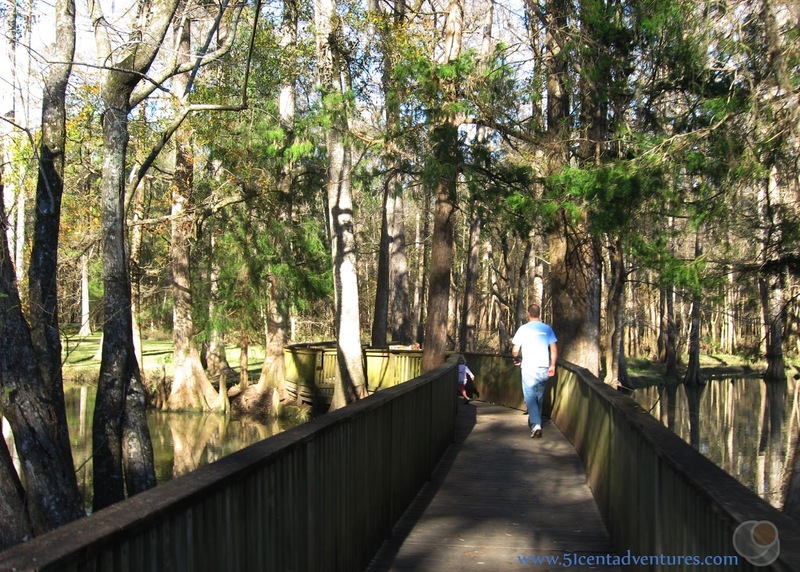 Places Nearby: Falling Waters State Park is another state park just over the Alabama/Florida border. This park has a 73 foot water fall. I think this might have to be the destination for our next weekend trip.